The last jaguar reported on Hacienda Barú was shot by a hunter in 1955. The large, spotted cat had killed one of the hunter’s dogs several weeks earlier, and he was so furious that he pursued it with his remaining three dogs until one day they treed it, and he shot it off of a limb. This was fifteen years after the onset of the massive deforestation of the region. Much of the jaguar’s habitat had been destroyed, and its prey base had been seriously depleted by hunters. As a result the big cat had resorted to killing dogs and domestic pigs in order to survive. The people who lived in the area applauded the killing of the beast. The deforestation continued into the early 1980s as did the uncontrolled hunting in most areas. At Hacienda Barú, where we had a large area of rainforest in reserve, we prohibited hunting beginning in 1976, and hired a forest guard to try to enforce the ban. Some hunting continued, in spite of the guard, but at a greatly diminished rate. Cat sightings were rare. One of my cowboys killed an ocelot in 1974, and a neighbor killed a jaguarundi a couple of years later. In the following years I heard of several sightings of cats, mostly ocelots and jaguarundis, but definitely nothing larger. Near Matapalo, about 12 kilometers from Hacienda Barú a man named Eliecer Castro also had a large rainforest reserve in which he prohibited hunting. Don Eliecer had some white-tailed deer in captivity. He had acquired them from a friend in Guanacaste and trucked them to his ranch in Matapalo. Most of the deer were kept in captivity, but from time to time a few would escape. Eventually Don Eliecer released them all. They thrived in the rainforests and pastures of the surrounding area and established a breeding population. Many of the descendents of those original Guanacaste imports are still to be found in the region. At the time Don Eliecer never imagined that his deer would one day become an important prey animal for large cats. In 1987 we started offering several different ecological hikes through the rainforests of Hacienda Barú, including an overnight camping tour. In the dry season of 1989 there was a papaya tree with mature fruit in the middle of a cleared area around the jungle campsite. Every day, in the late morning, a large group of coatis appeared in the clearing and fought over the nearly ripe papaya, tearing them to pieces and gobbling up the sweet, orange fruit. Then, from one day to the next, all of the coatis disappeared from the area, and the fruit ripened until it either fell off the tree or was eaten by birds. At the same time we found large claw marks on a tree near the camp, and an extremely large paw print at the edge of a nearby stream. A few days later, the neighbors on a bordering farm observed a large, tan-colored cat at the edge of a pasture where cattle were grazing. Their horses were terrified of the cat, which was obviously a puma, and attempted to rid themselves of the riders and run off. From then until 2010 there were sporadic reports of puma sightings and puma tracks. Once someone reported a puma on a farm near Matapalo, and people quit sending their kids to school for a while for fear the large cat would attack them. 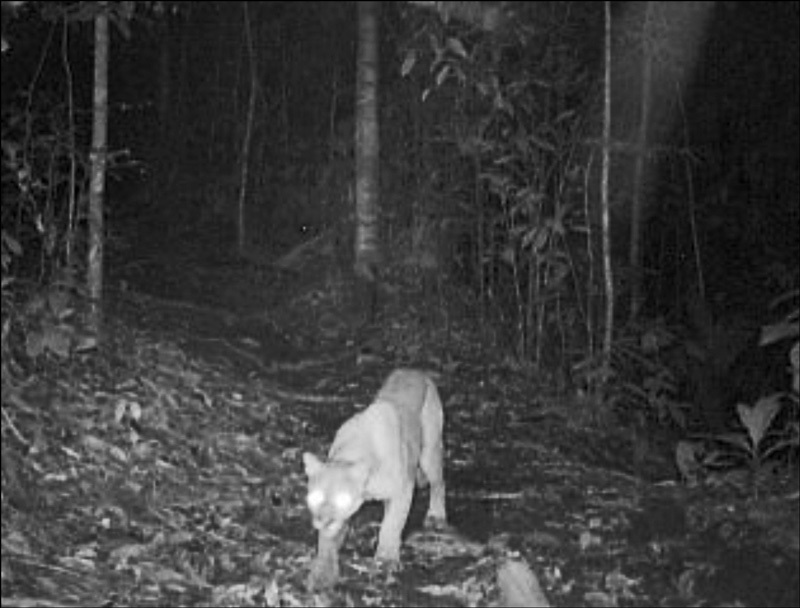 For many years, it appeared that there was only one puma that roamed the area extending from Matapalo to Hacienda Barú, preying mainly on deer in the Matapalo area and peccary around Hacienda Barú. A couple of times each year, always when there were lots of peccary in the area, we would see puma tracks, but we never actually saw one of the cats. We did, however, put them on our species list, along with four other felines: ocelot, margay cat, jaguarundi, and little spotted cat. 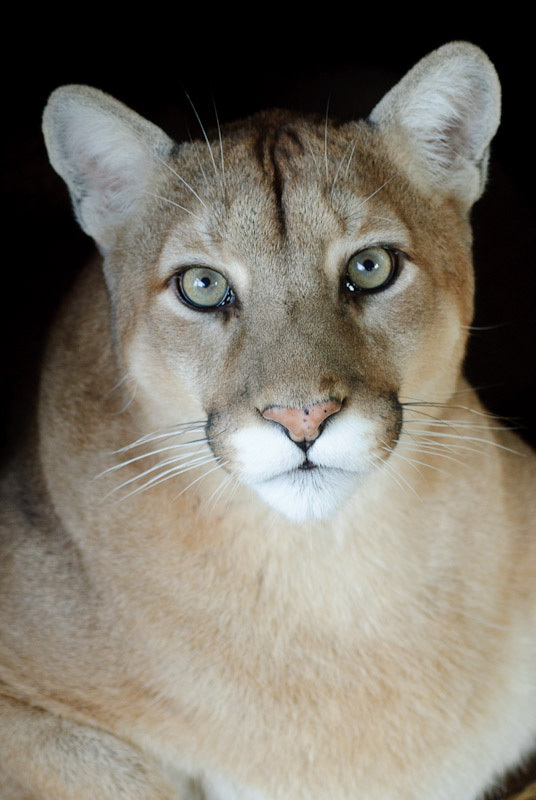 In North America the large cats known as mountain lions or cougars are the same species we call the puma in Costa Rica, though the ones we have here are slightly smaller. The difference in size is probably because those that reside in the temperate climates of the north prey primarily on larger ungulates such as mule deer and elk, and, over many years, natural selection has tended to favor larger cats. An adult puma in Costa Rica will average 110 cm. (43 inches) from the tip of the nose to the base of the tail, and weigh about 50 kg (110 lbs.). White-tailed deer which weigh about 30 kg. (66 lbs.) and collared peccary which weigh only about 20 kg. (44 lbs.) are the largest prey a puma is likely to kill. A large part of their diet consists of considerably smaller animals such as coatis, raccoons, and opossums. Pumas climb well and have been known to leap onto tree branches as high as 5 meters (16 feet) above the ground. Studies in Corcovado National Park indicate that all four species of monkeys are consumed by pumas and both species of sloths. Once while hiking through Corcovado with a local guide we heard a terrible racket about 100 meters from the trail. Our guide told us that the sound was the extreme alarm call of a troop of spider monkeys, and that the only thing that would frighten them enough to cause that much commotion would be a puma lurking through the forest near their location. The next time I heard a spider monkey give that same alarm call was on Hacienda Barú in the year 2012. In the late 1990s a herpetologist named Mason Ryan stayed with us on Hacienda Barú for about six months. He spent most of his time wandering around the jungle at night looking for frogs and snakes. One night while working in the highland rainforest of Hacienda Barú Mason got the feeling he was being followed. Then he heard what he described as a puma’s snarl. He reckons this came from about 30 meters away on the uphill side. A few seconds later he heard a similar snarl from the downhill side. He stopped what he was doing and returned to the house. It was the only time in six months of walking around the jungle alone at night that Mason became frightened enough to return to the house. I asked him if he was sure it was a puma’s snarl. “I worked in the Bronx Zoo as a volunteer for five years,” he replied. “Part of my job was to clean the puma’s cage. I will never forget that snarl.” The next day one of our guides went to the location looking for tracks. He didn’t find any tracks, but did find what appeared to be a spot where a peccary had been killed. There was blood and peccary hair on the ground. During the years that followed there were sporadic sightings at Quintas la Guapil and the Firestone Center, both of which border Hacienda Barú National Wildlife Refuge. Finally in 2011 we had a definite sighting on Hacienda Barú. Pierre and Michele consider themselves to be serious ecotourists. They visited Hacienda Barú because of its reputation as a top destination for ecotourism in Costa Rica. They spent Saturday, April 23, 2011 walking on the nature trails of Hacienda Barú National Wildlife Refuge and enjoying the flora and fauna. About 3:30 in the afternoon, less than 500 meters (547 yards) from the lodge, they came to an abrupt halt, finding themselves face to face with two large, tan-colored cats. One of the cats was standing, and the other was crouching with its black-tipped tail straight out the back and raised. The crouching cat hissed at the two hikers. Pierre wanted to get the camera out of the back pack and take a photo, but Michele was nervous and wanted to leave. The couple stayed close together and slowly backed away. Once they were out of sight, they turned and hurried back to the lodge where Hacienda Barú guide Ronald Alpízar opened the gate for them. Breathlessly they told him their story. Ronald returned to the spot with the couple, but the cats were gone. They did, however, come across a large group of collared peccary close to where the encounter took place. When questioned further Pierre and Michele described the behavior of the crouching cat as aggressive, but not threatening. The one that was standing was quite passive. They estimated that the standing one was 60 centimeters (23.6 inches) tall at the shoulder. It is interesting that there were two pumas, because they are normally solitary animals. When you find a pair there are two possible reasons. When a female comes into heat she will be together with a male for about a week. They mate often, as many as 70 times a day. Biologists believe that this is because frequent copulation is necessary to stimulate ovulation. A mating pair of pumas will be anything but calm. The female yowls from time to time, and the male can be expected to be irritable and aggressive. The other possibility when there are two pumas together is that they are cubs that were recently separated from their mother. The female nurses her new born offspring for about four months, at which time she weans them off of milk. Nevertheless, they remain with her and are partially dependent on her for another year to a year and a half. At that time the mother will separate from the nearly full grown cubs and leave them by themselves. The cubs will often stick together for a month or more, and then each will go its own way. I believe that the pair of pumas that Pierre and Michele saw were siblings that had recently separated from their mother. 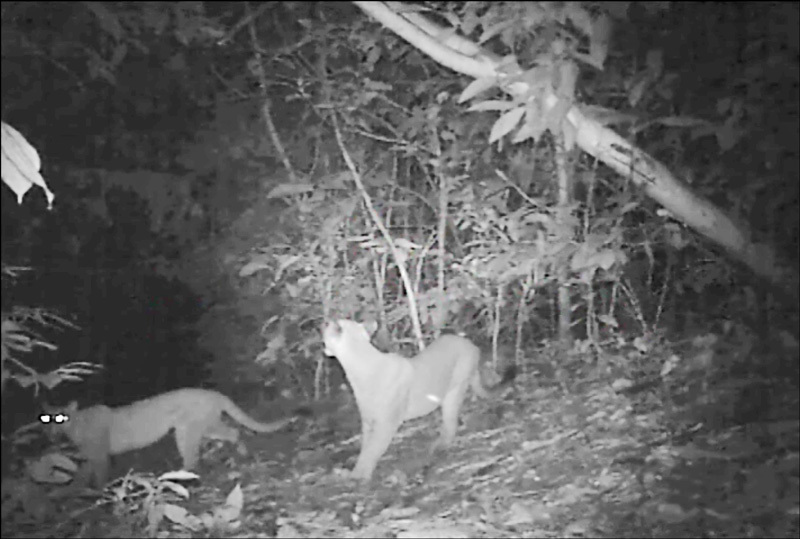 A week after that incident two pumas were sighted about three kilometers from Hacienda Barú. The local man who saw them described them as grown cubs. It is very likely that they were the same pair. On July 5, 2012 two pumas side by side were photographed by a camera trap at the Firestone Center for Restoration Biology. The camera was located about five kilometers from the location where the pair of cubs was seen by the French couple on Hacienda Barú more than a year earlier. Three months later, in October of 2012, some people who live in a place called Punto de Mira, located six kilometers from the Firestone Center, were awakened at 02:00 AM when their movement sensitive security lamps lit up the front of their house. They got up to see what had activated the lamps and, to their surprise and delight, discovered two pumas in the yard. These are probably not the same cubs as those caught by the camera trap, because those wouldn’t likely still be together after three months. All of these sightings have taken place in an area of about 40 sq. km. (15 sq. miles,) but that doesn’t necessarily mean that this group of pumas’ movements are restricted to that area. Since there have been three sightings of pairs of pumas, and these were all more than three months apart, we can conclude that there are at least three sexually mature females in this area. We can also conclude that there is probably at least one male, and that they have produced at least six offspring in less than two years. One male will normally defend a territory of 75 sq. km. (29 sq. miles,) or larger. He will share this territory with two or three females. All of this leads me to believe that we have a high density of these magnificent predators in the area around Hacienda Barú. This is really wonderful news because it is a strong indication that we have a thriving ecosystem. But it also brings up some questions. In nature all living things exist in a constant state of change, and only Mother Nature knows the plan. We can make an educated guess as to what the future may hold, but what really happens often comes as a complete surprise. Hacienda Barú National Wildlife Refuge has been protected from hunters since 1976. Occasionally a hunter will sneak into the reserve and kill a paca or a peccary, but not very often. At this time there are four park rangers who work to protect Hacienda Barú and some of the surrounding properties. Several other neighbors also actively protect their properties from hunters. For this reason there are a lot more peccary here than any place else. Hunting is rampant in much of the rest of the area. It is probable that the high density of pumas in this area is due to the large population of peccary. According to studies in Corcovado National Park pumas eat many different animals, but their preferred prey is the coati. In the absence of coatis the collared peccary becomes their primary source of food. Those who live in the area around Dominical and Hacienda Barú know that three years ago we had an overpopulation of coatis. There were so many that they would come up to people and beg for food. People would stop at the fruit stand near the bridge and buy bananas to feed the coatis, and large groups of them would gather there to take advantage of the free hand-outs. Today, three years later, we seldom see a coati. Disease may have killed many of their number, but I’m sure that a large part of the population fell prey to the pumas. In fact the beginning of the decline of the coatis coincided with increased puma sightings in the area. We still have lots of collared peccary at Hacienda Barú, but with the high density of pumas in the area, their numbers have already noticeably declined and will surely continue to do so. This brings to mind the question of what the pumas will eat when there aren’t enough peccary to feed them. In my opinion they will first resort to killing more of the smaller animals for food. These will include opossums, armadillos, monkeys, sloths, iguanas, agoutis, pacas, etc. For years I have wondered why we have such a high population density of sloths in this area. On a three-day visit to the Corcovado National Park a few years ago we didn’t see a single sloth. The reason could be that in Corcovado they are heavily preyed upon by the pumas. I think eventually we can expect problems with puma attacks on domestic animals like dogs, cats, pigs, goats, calves, and colts. Hopefully there won’t be any attacks on people, but this has happened on rare occasions in Corcovado and could happen here. It is very nice to know that we have a healthy ecosystem that will support large predators, but it is important that we recognize that this situation may bring certain problems, and we must be prepared to deal with them.